THE FORMER State School Buildings on East Barrack Street, Deloraine, circa 1895, have been sold and converted into a family residence and sporting attire manufacturing business. Simply Oarsome owners, Neil and Martine Myers relocated from Geelong to the ‘unspoilt’ beauty of Lorinna around 15 years ago, before purchasing the State School for its spacious capacity and close proximity to the Deloraine Primary School for their two daughters. “We have always had a strong connection with Tasmania. We honeymooned here and visited often for competitive rowing events,” Neil said. 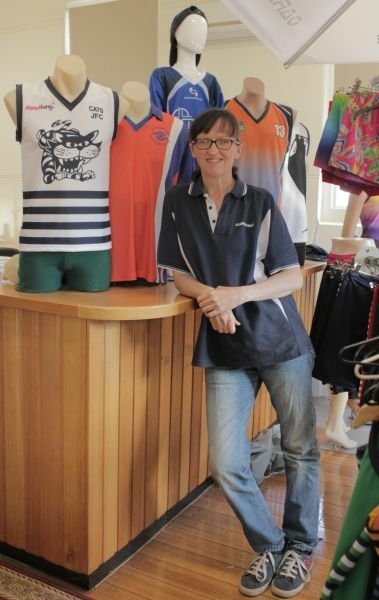 Simply Oarsome is the only business in Tasmania that manufactures custom sports apparel using a sublimation dying process (sub dye). Sublimation is best described as a process of change in a state of matter through heat and pressure that prints the design ‘within’ the garment. Different fabrics can be used but the newer polyester fabrics to emerge over the last ten years are lighter, bacteria resistant, have moisture control, UV protection and won’t fade. Neil notes the stark contrast in Oarsome’s garment production to the sewing methods used by Mathew Simms, who resides in the former headmaster’s residence next door. The newly plastered school hall is where most of their sewing takes place. They have a stock display at front of shop, but most of their business is conducted online. A recent order is going to St Petersburg in Russia! Other ‘sublimatable’ products are: water bottles, cups, plates, pens caps and nametags. In addition, a photo or design of choice can be printed onto a metal sign or trophy plate in a process known as Chromalux.